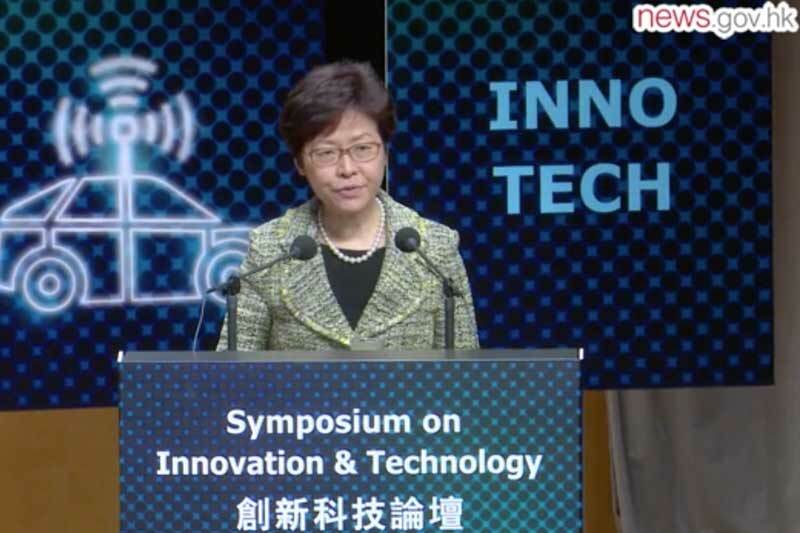 On October 13, 2017, Hong Kong Chief Executive Carrie Lam (above) gave a speech at the Innovation & Technology (I&T) Symposium, 2 days after her maiden Policy Address. During her speech, she spoke about the eight major areas of development that her government will be stepping up efforts in with regards to I&T, which she also spoke about in her Policy Address. Firstly, the Hong Kong Government has set a goal to double the R&D expenditure as a percentage of the Gross Domestic Product from the current 0.73% to 1.5% by the end of the current-term Government’s five-year term of office. Apart from Government injecting more resources into the Research Endowment Fund under the University Grants Committee for allocation to the eight publicly-funded universities, super tax deduction incentives will also be provided for expenditure incurred by private enterprises on R&D, to the tune of 300% for the first HKD$2 million and 200% for the remainder. Next, the Government will step up efforts to nurture talent and recruit overseas talents. A HKD$500 million Technology Talent Scheme will be launched to establish a Postdoctoral Hub to provide funding support for enterprises to recruit postdoctoral talent for scientific research and product development and another HKD$3 billion to provide studentships for local students to engage in research postgraduate programmes. world-acclaimed universities, R&D institutes as well as technology enterprises will also be invited to collaborate and carry out forward-looking research projects with social benefits. Thirdly, to further boost the momentum of the growing number of venture capital funds setting up in Hong Kong in recent years, a HKD$2 billion Innovation and Technology Venture Fund was recently launched and VC companies are invited to join hands with the Government to invest in Hong Kong’s technology start-ups. Next, the Government will continue to provide the hardware in terms of technological research infrastructure and related facilities. At present, Science Park, Cyberport, Hong Kong Productivity Council and R&D Centres have been supporting local R&D activities. There are a number of infrastructure projects in the pipeline, including expansion of the Science Park, development of the Data Technology Hub and the Advanced Manufacturing Centre in the Tseung Kwan O Industrial Estate. The Government is also working in full speed to implement the Hong Kong-Shenzhen Innovation & Technology Park at the Lok Ma Chau Loop, based on an agreement the Government has signed with the Shenzhen Municipal People’s Government in January 2017. When completed, this will be the largest I&T infrastructure in Hong Kong. A residential building for talent called InnoCell is also being built at Science Park and should be completed in 2020. The fifth area will be to review existing legislation and regulations, so as to remove those outdated provisions that impede the development of innovation and technology. Chief Executive Lam will task the newly formed Policy Innovation & Co-ordination Unit which works directly with her to spearhead this exercise. Next, government data will be opened up for use as raw materials in technological research, innovation and development of smart city. The Hospital Authority is taking steps to set up a big data analytics platform on health data, with other useful data in other areas to follow. Seventh, there will be an adjustment to government procurement methods to include I&T as a criterion in the selection process, with a view to encouraging local technological innovation. Lastly, the Government will step up STEM education both at the school and community levels. Electronic fairs will be encouraged to consider opening up a day for school visits so that students may be impressed by what technology could offer and inspire them to learn more. The Leisure & Cultural Services Department will update the permanent exhibitions of the Hong Kong Science Museum to further promote STEM education using the museum’s facilities.